Bizzy Bubs are on the go! These little bundles of joy are way too busy for bedtime! Full of life and personality they can't wait to play and show you what they can do. 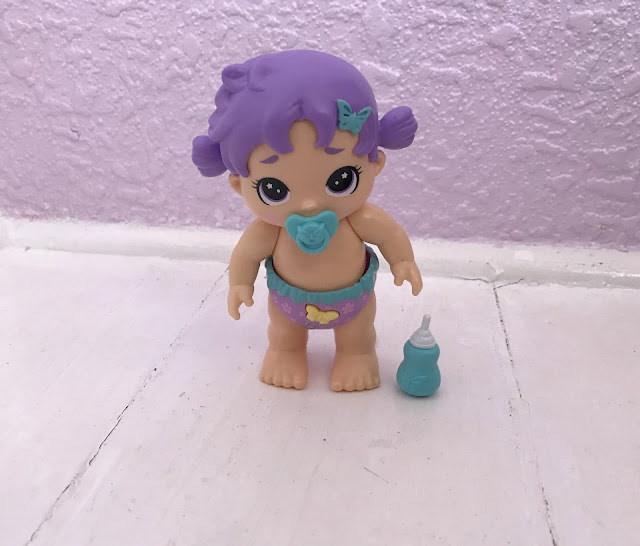 The two dolls we were sent were very different, Polly Petals had purple hair and she could walk and talk when you pressed the butterfly button on her nappy. Poppy has blue hair and she crawls and babbles like a real baby. Both dolls come with a bottle and dummy and they make drinking and sucking noises when you put them in their mouths. The dolls are quite small making them the perfect size for children to hold and play with. 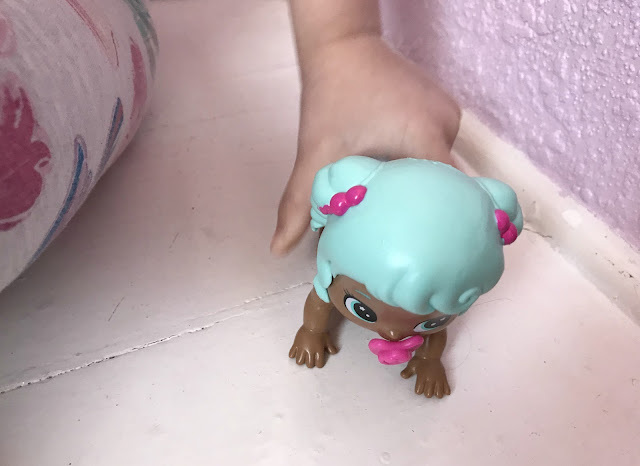 Sophia loves pressing the buttons on the dolls nappies to make them walk or crawl across the floor. She has had chicken pox and been housebound for the past week so she has spent lots of time playing with her new Bizzy Bubs and they have kept her entertained. You can also buy sets as well as the single doll packs, you can buy a Cutie Carrier set for £22.99 which comes with an exclusive Swirlee baby. Or you can buy the Cute Crib £22.99 which come with an exclusive Gracie baby doll. I think that children around aged 5 plus will love these little dolls and have hours of fun playing with them, just like my daughter. They are available to buy now from Character options here in the UK and are part of the growing Little Live (pets) collection of toys. You can check out www.bizzybubs.com to find out more about the dolls and watch videos. 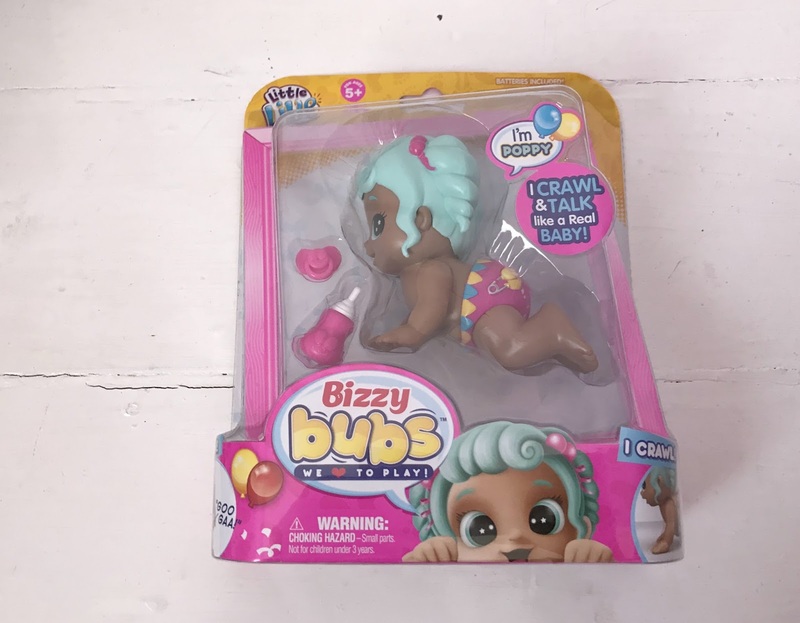 Bizzy Bubs are available to buy from all good toy stores and Amazon priced at £14.99 for a single pack or £22.99 for the playsets. Disclosure I was sent these dolls for the purpose of this review, however, all opinions are my own.